Over the next century, rising temperatures and changing precipitation patterns across the Midwest will likely have widespread consequences for Indiana's forests. Expected changes include shifts in the distributions and abundances of trees, understory plants and wildlife, as well as changes in the environmental, economic and cultural benefits these forests provide. This report from the Indiana Climate Change Impacts Assessment (IN CCIA) examines the direct and indirect impacts that climate change is expected to have on Indiana's forests. The report specifically addresses forest regeneration, forest composition, tree growth and harvest, wildlife habitat and forest products. The findings presented here are based primarily on the IN CCIA Forest Ecosystem Working Group technical report (Phillips et al., in review) and the IN CCIA report Indiana's Past and Future Climate (Widhalm et al., 2018). Predicting the future of a complex ecosystem with hundreds of interacting species is challenging, even under stable conditions. But conditions are not stable. Indiana's forests are living through simultaneous changes in climate, the concentration of carbon dioxide (CO2) in the atmosphere, exposure to atmospheric pollutants that can damage or fertilize trees, management practices and other factors. Even a single change, such as an increase in temperature, has consequences that ripple through the system. Because both forests and the changes in climate and atmosphere are complex, the results described in this assessment are necessarily more qualitative than quantitative. Predicted changes in climate – warmer, wetter springs followed by hotter, drier summers – may increase habitat suitability for a growing assortment of tree species in Indiana. More species' habitats are predicted to enter the state than leave the state by century's end. Habitat suitability is expected to increase for 43 to 52 percent of tree species and decrease for 17 to 29 percent of tree species in Indiana. A longer growing season and greater concentration of carbon dioxide (CO2) in the atmosphere may increase forest productivity and carbon uptake in the short term. However, increases in the frequency and intensity of spring flooding and summer drought are likely to offset or negate these benefits. The wetter springs and more frequent flooding will also promote pathogen-related diseases. Many of the tree species that are positioned to become dominant as forests age, such as maples and tulip trees, are poorly adapted to the warm, drier summer conditions that are predicted by most climate models. Thus, changes in forest composition have the potential to decrease forest productivity and carbon uptake. However, management factors, such as rotation length and harvesting intensity, may influence changes in species composition and growth rates. Forest regeneration, which depends on the survival and growth of tree seedlings, will be affected by changes in the climate, as well as by changes in the abundance of other species such as herbivores and understory plants. Longer growing seasons could help seedlings establish, but increased spring precipitation and flooding, as well as drier summers, may damage seedlings during sensitive phases of growth. Changes in climate will likely have varying effects on the proliferation of invasive plants already in the state. Warmer temperatures may increase the number of new invasive species, as plants such as kudzu and Chinese privet expand their ranges northward in response to an altered climate. The number of days with frozen soil is projected to drop by half to two-thirds by late century1, dramatically shrinking the time window for harvesting trees without environmental disturbance and damage. The risk of soil rutting and erosion from harvest activities on wet soil is likely to increase in Indiana. Other forest benefits are also likely to be affected by a shifting climate. For instance, maple syrup season is expected to be earlier and shorter, and some species commonly used as Christmas trees, like white pine, are likely to suffer from the warmer temperatures. At the beginning of the 19th century and before, nearly 90 percent of Indiana land was covered with forest. As land was cleared, mainly for agricultural use, the character of Indiana’s landscape was transformed, and by 1900 forests covered only 4 percent of the state. The Indiana State Board of Forestry, established in 1901, guided a resurgence of the state’s forest. Land-clearing, burning, wildfires, grazing and harvesting declined by the mid-20th century, and abandoned agricultural land reverted naturally to forest or was planted with non-native species. 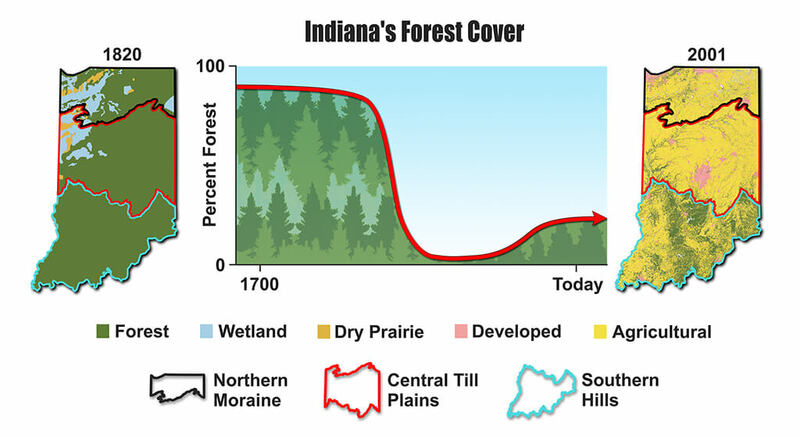 By the end of the last century, 23 percent of Indiana, or 5 million acres, was covered in forest. Today, Indiana’s forests provide habitat for wildlife, recreation for residents, and contribute to a significant portion of the state’s economy. Forest products account for $7.5 billion annually, about 2.7 percent of Indiana’s gross domestic product. Spending on wildlife-related recreation (e.g. hunting, fishing, birding) brings in about $1.7 billion per year. Indiana’s climate has become warmer and wetter over the last century (Widhalm et al., 2018). These trends are projected to continue, with winter and spring becoming warmer and wetter, and summer and fall becoming hotter and possibly drier. The state’s annual average temperature is expected to rise 5 to 6°F by mid-century and 6 to 10°F by the end of this century, depending on the amount of heat-trapping gases released to the atmosphere by human activities2. 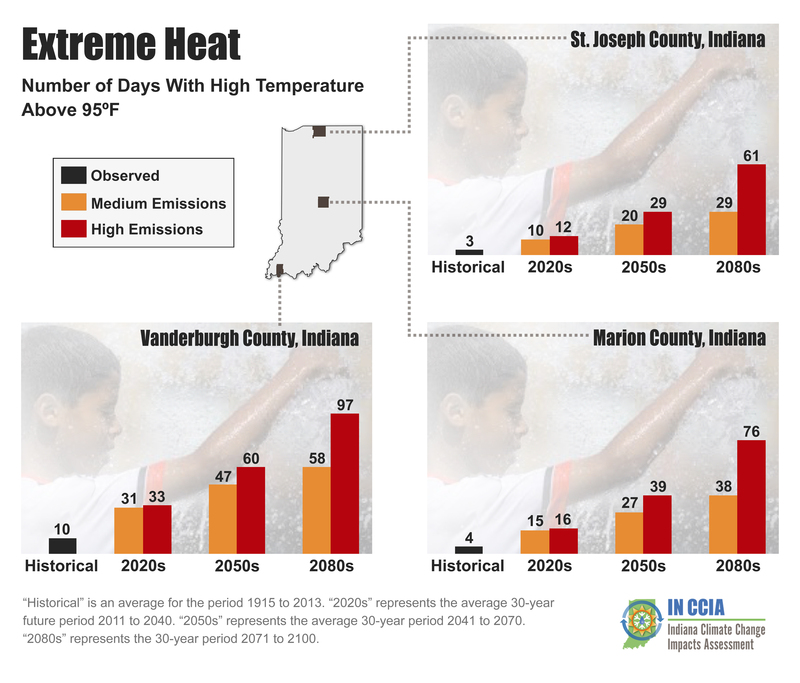 In southern Indiana, which contains much of the state’s forest land, the daily high temperature is expected to exceed 95°F for 50 to 89 days per year by late century3, with more than 100 of these extremely hot days per year predicted for localized areas under a high-emissions scenario. For comparison, the southern third of the state historically4 averages about seven extremely hot days per year. Statewide, precipitation is projected to increase by about 17 percent in spring and 32 percent in winter by late century, with a smaller proportion of that moisture coming as snow5. Climate models suggest that summers could get 7 percent less rain5 by late century. While such changes in summer precipitation may be minor, it’s important to note that warmer temperatures will speed up the evaporation of water from soils and plants, making water stress more common in these forests. Forests depend on the survival and growth of tree seedlings to naturally regenerate, and the natural production of new trees depends on complex relationships among seed production, seed-eating animals, forest disturbances such as fires, and climate. With their small stature and short roots, seedlings are highly sensitive to environmental conditions and plant-eating animals. 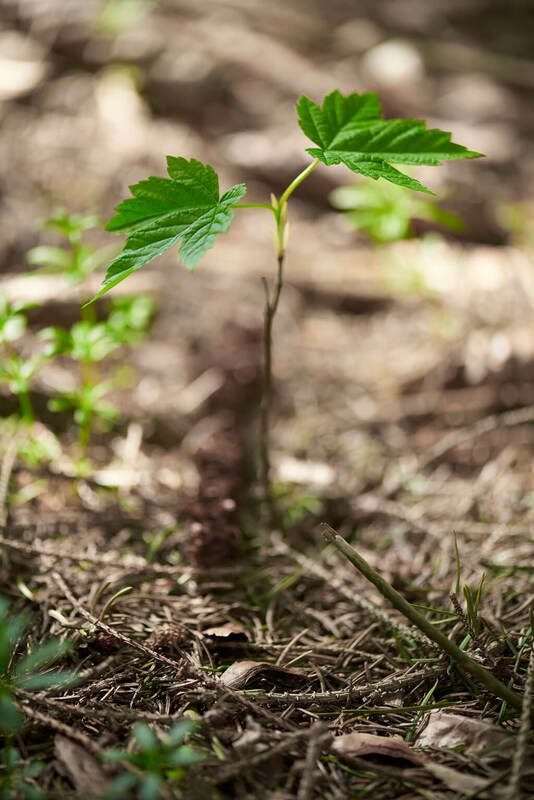 Changes in the availability of water, light or nutrients in the soil will affect these youngest trees first, with consequences for the developing forest. Thus, increases in spring flooding and less reliable summer and fall precipitation could both reduce the success of seedling regeneration. Seedling survival and growth also depend on competition with other plants that live in the forest understory, including some highly competitive invasive plants. For instance, Japanese stiltgrass invasions in southern Indiana slow the growth of seedlings of many native tree species (Johnson et al. 2015). Similarly, Amur honeysuckle, a widespread invasive shrub, reduces survival rates of native tree seedlings (Owings et al. 2017). As the climate warms, additional invasive plants that are thought to have been kept out of Indiana by cooler temperatures could begin to spread into our state from the south. For instance, Chinese privet, a dense shrub that crowds out native species, is expected to pose increasing risks to Indiana forests. At the same time, other factors that are less sensitive to climate are also critical to forest regeneration. For instance, deer eat many tree seedlings, and so deer population sizes strongly affect seedling regeneration rates. And importantly, the growth of seedlings to maturity often depends on intentional management practices or chance events that open gaps in the canopy. Above: Projected changes in tree habitat suitability in Indiana by 2100 based on a high-emissions scenario. Species listed above are a selection of more than 70 species found in Indiana. Full species list and projections for medium-emissions scenario are available. Sources: Prasad et al. (2014) and Phillips et al. (in review). Climate change has already had significant impacts on forest composition in the region (Fei et al 2017) and will continue to affect the suitability of habitat for certain tree species (Prasad et al. 2014). Depending on the region and emission scenario, changes in temperature and precipitation are expected to reduce habitat suitability for 17 to 29 percent of Indiana’s tree species, including American basswood, American beech and eastern white pine. Those losses would be offset by increased habitat suitability for species such as silver maple, sweetgum, and sycamore – a total of 43 to 52 percent of Indiana’s current tree species. Additionally, Indiana’s forests are expected to provide newly suitable habitat for many tree species from other states, including black hickory, blackjack oak and loblolly pine. Experiments have shown that plants, including trees, can grow faster when there is more CO2 in the air (Terrer et al. 2016). As CO2 concentrations continue to rise in response to human activities, some tree species are expected to benefit more than others, which could affect the makeup of the forest. However, long-term increases in tree growth rates often depend on other resources being abundant, and so the benefits of added CO2 are not guaranteed. Recent research suggests that the benefit of increased CO2 could depend in large part on a tree’s relationship with different types of fungi in the soil (Terrer et al. 2016). Tree species that associate with fungi known as ectomycorrhizae (e.g., oaks, hickory, beech and pines) are likely to respond most strongly, particularly in nutrient-poor conditions. As the concentration of CO2 increases, these tree species may have an increasing advantage. Understory species will also be affected by the changing climate and atmosphere. For instance, poison ivy, a hazardous woody understory species, is expected to benefit from increasing CO2 concentrations (Mohan et al. 2006). Wet springs and a rising likelihood of flooding will promote pathogen-related diseases, including those spread by insects. Wetter springs have been associated with outbreaks of bur oak blight in Iowa and Illinois and could spread to Indiana as spring precipitation increases. Gypsy moths, which damage some oak species, are expected to increase in population, though wetter springs could also lead to a rise in fungal pathogens that damage the moths’ larvae. More research is needed to understand the types of pests and pathogens that may increase with changes in climate and the magnitude of their effects. Forest managers can take action to stave off some changes or help transition forests to the conditions of a future climate. Some forest species may be helped by protecting refugia, reducing environmental stressors through silvicultural treatments, or enhancing species and genetic diversity. Transition strategies could include favoring forest populations and species that are well-suited for a changing climate. 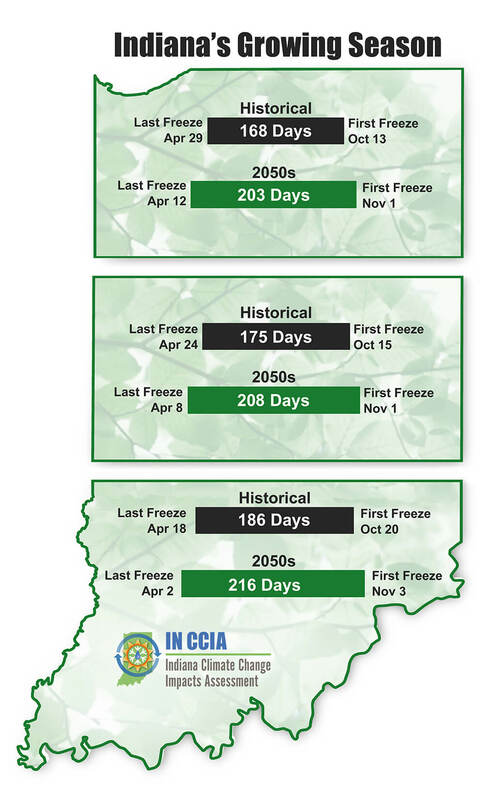 Above: Growing season length and average first/last freeze dates for northern, central and southern Indiana. “Historical” is the average for the period 1915 to 2013. For future projections, “2050s” represents the average of the 30-year period from 2041 to 2070 for the-high emissions scenario. Data for other locations and time periods available. Source: Hamlet et al. (in review). Warming temperatures, shifting rainfall patterns and increasing concentrations of CO2 in the air will affect tree growth rates as well as carbon uptake and storage. Recent trends in the growth of Indiana’s forests have shown that hotter, drier summers can decrease tree growth even as the growing season gets longer. Records from Morgan-Monroe State Forest in central Indiana show that the period of time in which deciduous trees have had green leaves each year has been getting longer, but surprisingly, annual wood growth has been declining (Brzostek et al., 2014). While some decline in wood growth is expected as trees age, the declines observed at Morgan-Monroe were driven primarily by drier soils during the growing season, despite a long-term trend in the state towards wetter conditions (Widhalm et al., 2018). Many of Indiana’s forests are currently shifting from more drought-resistant oak and hickory species towards more drought-intolerant species such as tulip poplar (yellow-poplar) and sugar maple. This shift is a consequence of long-term reductions in disturbance from fire and grazing resulting in a light environment too shady for oak and hickory regeneration. The drought-intolerant species do not necessarily die or lose their leaves during the drought, but rather stop photosynthesizing at the first signs of dry conditions. Thus, the combination of more drought-intolerant species becoming dominant and a mildly drier growing season (consistent with projections for the region; Widhalm et al., 2018) could reduce forest carbon uptake by up to 17 percent (Brzostek et al., 2014). While shifts in carbon storage are likely, projections of how carbon storage will change are complex, as they depend on changes in tree growth rates, species composition, disturbance, pollution and management. A longer growing season, increasing CO2 and unintentional fertilization from nitrogen pollution could all increase the amount of carbon captured, but any benefits from these factors could be overwhelmed by the drawbacks of drier soils. Other forces expected to reduce carbon storage include damage from tree diseases, ozone pollution and physical disturbances such as fires and floods (Talhelm et al. 2014). Species such as sugar maple and American beech are carbon-dense, meaning they store greater amounts of carbon. But if those species decline, so too will carbon storage. 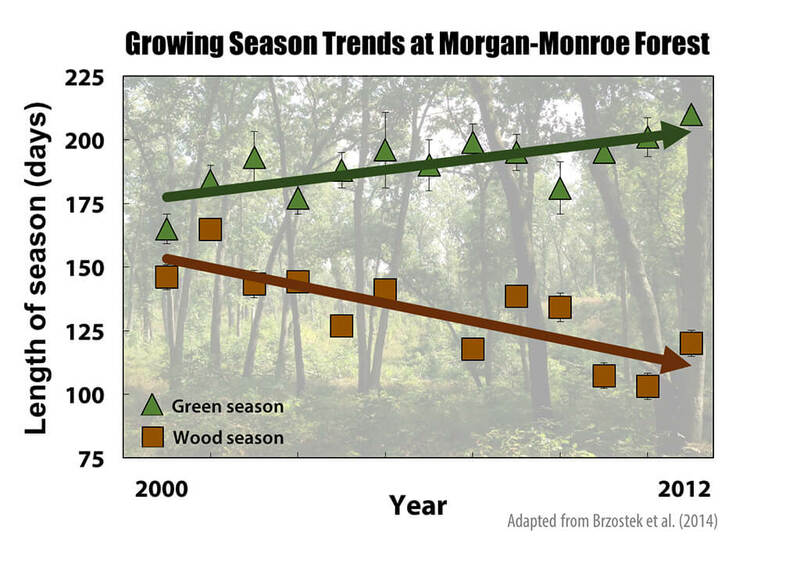 Above: Recent trends in growing season length (as measured by the presence of green leaves) and wood growth period at Morgan-Monroe State Forest in southern Indiana. Source: Brzostek et al. 2014. Increased atmospheric CO2 concentrations can directly boost plant growth and help plants conserve water by closing the pores in their leaves. However, a lack of sufficient water or nitrogen in the soil can reduce or even negate the growth responses of plants to additional CO2. This has been recorded in the study mentioned above at the Morgan-Monroe State Forest, where drier-than-average years have reduced forest productivity despite longer growing seasons and elevated CO2 concentrations (Brzostek et al. 2014). In addition to directly reducing growth, drought stress can also make trees more susceptible to attack by pests and pathogens such as bark beetles. Drought conditions also raise the risk of forest fires, and warmer winters could lead to more ice storms that can damage trees. Invasive species also pose threats to tree growth and survival. There have not been any studies specifically focused on how climate change affects Indiana’s invasive species problem. However, case studies that examine particularly problematic species that could affect the state in the future provide some insights. A small aphid-like insect, the hemlock woolly adelgid (HWA), has killed populations of hemlock trees along much of the eastern U.S. The insect currently has populations in Ohio and Kentucky and could spread to Indiana’s remnant populations of hemlocks as winter temperatures warm (Dukes et al. 2009). However, high summer temperatures reportedly kill HWA and complicate this prediction (Mech et al. 2018). While hemlock is relatively minor component of Indiana’s forests, it tends to occurs in very specific places in the landscape (cool, moist groves); as such, it’s unclear which species, if any, would replace hemlocks following a HWA infestation. Kudzu, the invasive vine that overgrows and chokes forests in the southern U.S, could start expanding in Indiana within the next few decades as temperatures increase. This species already causes $100 million to $500 million in economic damage to forests and agricultural land in the U.S. each year. As the warm season lengthens, timber harvesting windows are expected to shrink. Soils can support heavy logging machinery when they are deeply frozen (6-to-12-inch frost depth at minimum) in the winter or extremely dry in the summer. Currently, logging during the winter causes the least environmental damage in many locations as the forests that provide habitat for the endangered Indiana bat are restricted from logging during the summer. Warming temperatures will decrease the number of days in winter when soils are frozen and suitable for harvesting. 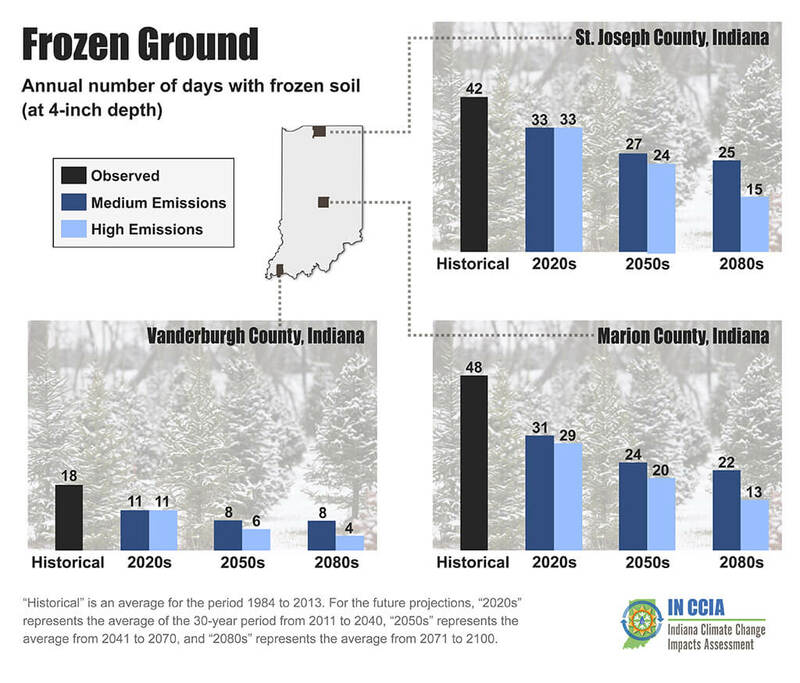 Under a medium-emissions scenario, locations in central Indiana are projected to have only three to four weeks per year with frozen soils by mid-century, compared to almost seven weeks historically6 (soil frost data are for 4-inch depths and thus likely overestimate the length of timber harvest windows). Also by mid-century6, the period of each year with frozen ground is expected to drop by more than a third in northern Indiana and by more than half in the south of the state, where soils might be sufficiently frozen for a week or less. Changes in winter soil conditions will be further compounded by substantial increases in cold-season precipitation. Harvesting during wetter springs or warmer winters would be more likely to cause soil rutting and/or erosion, especially on steep slopes. Above: Number of days per year with frozen soil (at 4-inch depth) for three representative Indiana counties. Note that the suitable winter season for logging would likely be shorter, as soils must be deeply frozen to avoid damage. “Historical” is the average for the period from 1984 to 2013. For future projections, “2020s” represents the average 30-year period from 2011 to 2040, “2050s” represents the average from 2041 to 2070, and “2080s” represents the average from 2071 to 2100. Source: Cherkauer et al. (in preparation). Indiana’s forests provide habitat for a wide range of wildlife, as well as a variety of other benefits such as flood reduction. A forest’s structure and tree species play strong roles in determining the types of wildlife that call it home. While management decisions by landowners largely determine these characteristics in many Indiana forests, climate change is also influencing the character of the forests and the benefits that forests offer to wildlife. Some species beneficial to wildlife are projected to lose suitable habitat, while others, such as some oak species, may thrive under a changed climate, providing more food for mice, wood rats and deer that feed on acorns and other seeds. Wildlife species once constrained by cold winters may be able to move north as temperatures rise. That movement will require a pathway of suitable habitat, however. The swamp rabbit, for instance, might be able to move north later in the century, but it is unlikely to do so on its own since it lives in bottomland forests—forests growing in low positions on the landscape that are periodically wet or flooded. The areas that are most likely to have suitable temperatures in the future are mostly agricultural lands. As shifting climate patterns alter the timing of tree flowering and seed/nut production in Indiana’s forests, migrating animals that depend on natural cycles may also be affected. For instance, migrating birds travel to breeding grounds as food there becomes available, but their timing may be thrown off by warming temperatures, leaving them with little to eat. Organizations working to restore forest habitat throughout Indiana should take projected changes in temperature and precipitation into account. Proactive efforts to restore areas with climate-adapted species may ensure the greatest long-term benefits for wildlife. The recent restoration of bottomland forest in the Patoka River National Wildlife Refuge and Management Area provides an example of such an effort. Tree species planted at this site were selected to be pre-adapted to projected increases in flooding and to provide abundant food for wildlife. In addition to providing habitat, bottomland forests minimize problems from flooding by slowing overland water flow and reducing the transport of sediment and nutrients downstream. As precipitation comes in heavier events in the future, these properties of bottomland forests are likely to become more important. Forests adjacent to agricultural fields can slow down runoff, minimizing erosion. At the same time, by slowing down water flow, these forests can capture eroded sediment and promote conditions that allow soil bacteria to release nitrogen back to the atmosphere, thereby reducing nutrient pollution in lakes and estuaries. As spring runoff increases, it will become important to plant flood-tolerant tree species over larger areas to maintain these forest benefits. Climate tolerances should be taken into account when selecting species, as newly planted seedlings are particularly susceptible to drought and flooding in spring. Even mature trees planted near reservoirs or rivers can be killed in wet years when water levels rise if they are not adapted to flooding. Timber stocking of many of the species important to Indiana’s thriving hardwood lumber industry is expected to change with climate7. 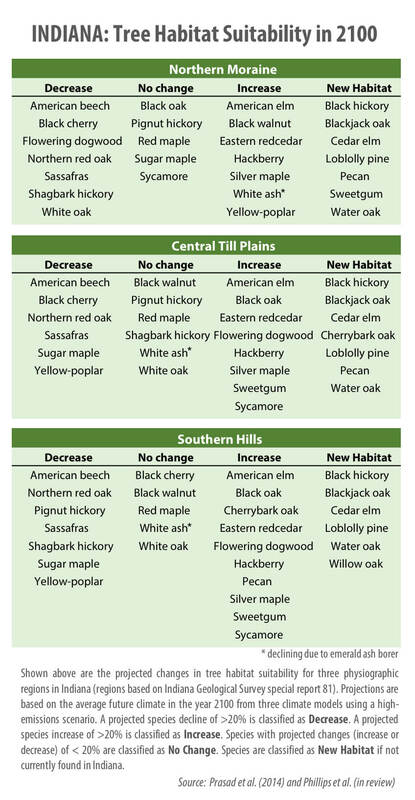 By late century, the suitable habitat for northern red oaks is projected to decline statewide while that of other oak species, such as black oak, cherry bark oak and white oak8, is expected to increase or show no change. Many new species of oaks are expected to find new habitat in Indiana. The habitats for sugar maple and yellow poplar (tulip trees) are expected to decline in the central and southern reaches of the state, but they may show no change or increasing suitability in the north. No change is projected for black cherry in the south, although habitat suitability will likely decline in central and northern Indiana. In southern Indiana, habitats for shagbark hickory and pignut hickory are projected to decline while bitternut hickory, mockernut hickory and shellbark hickory are projected to thrive. Black hickory, which is currently not present in Indiana, is projected to find suitable habitat across the entire state. Sweetgum and pecan, used for syrup and nut production respectively, are expected to increase in the south and expand to new locations in the central and northern portions of the state. Christmas trees, a $12.5 million part of the state’s economy, could experience stress. Habitat suitability projections suggest white pines will be dramatically reduced9. Projections are unavailable for other species typically grown as Christmas trees because they are being grown outside of their native range. Many of these species are adapted to cool climates and may not tolerate high summer temperatures projected for the coming decades. Increasing pests and diseases are expected to add to their stress. Hoosier families produce about 10,000 gallons of maple syrup each year. That’s enough syrup for about 1.9 million pancakes. Maple syrup production–length of season and quality of syrup–is completely dependent on the weather. According to the Indiana Maple Syrup Association, sap flows when nighttime temperatures drop below freezing followed daytime temperatures rising above freezing. 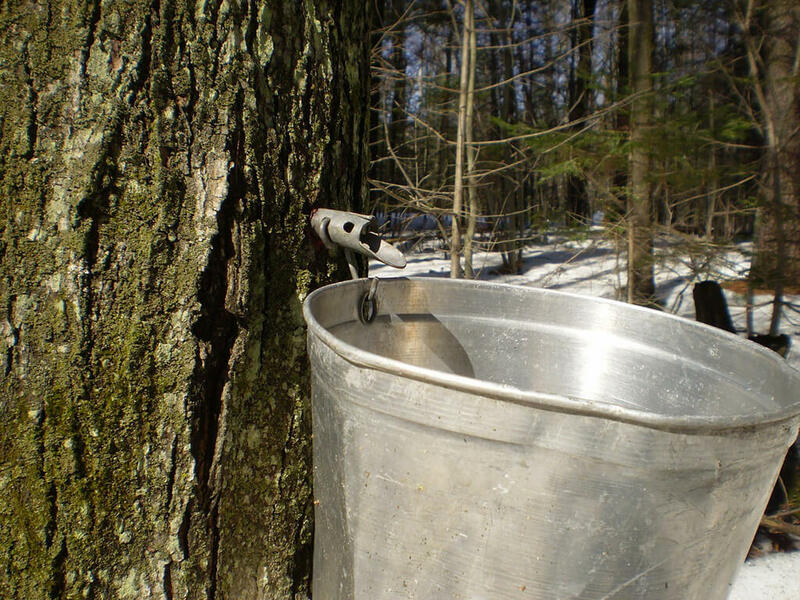 Sap will not flow during long stretches of cold weather, and syrup production stops when temperatures reach about 45°F10. And once the tree breaks dormancy and leaf buds open, the syrup will become bitter. Indiana’s sugar maple trees are usually “tapped” in February or March, but the exact timing in a given year can fluctuate from January to April. By mid-century11, Indiana is expected to see spring arriving about two weeks earlier. As springs warm, the window for maple syrup season is expect to shorten and shift to earlier in the year. There may be fewer sap flow days, which can reduce overall syrup production. Indiana’s future forests will be shaped by a mix of forces including climate, CO2, air pollution, invasive plant species, pests, pathogens and management decisions. The many interactions among these factors are still being untangled. Currently, researchers estimate how habitat suitability for a particular type of tree will change by assuming that the range of climates in that tree’s current range defines its future potential habitat. However, it is not clear whether seedlings have the same relationship with climate as mature trees, and even if they do, it is unknown how fast seeds or seedlings of the species will migrate naturally or be intentionally brought to newly suitable areas. This makes it difficult to predict how quickly Indiana’s forest composition might change. Climate is only one of many factors that are changing in and around Indiana’s forests. Some expected changes, such as a longer growing season and increases in availability of CO2 and nitrogen, are fairly certain in the short term and are likely to promote forest growth. Other expected changes, such as decreases in water availability during the growing season and increases in ozone pollution and competition or predation from invasive species, vary in certainty but are likely to slow forest growth. As Indiana’s upland forests continue to drift toward dominance by more moisture-loving species (like maples and tulip trees), they become more susceptible to growing-season droughts, suggesting forest productivity and carbon storage could decline. As precipitation increases in winter and spring, flood-intolerant species are likely to diminish in low-lying areas. Some shifts in the makeup of the forest are likely to occur gradually as new species arrive and survive in the new climate while some existing species fail to regenerate. Other shifts may occur rapidly, as more extreme droughts or floods kill ill-adapted species or milder winters lead to new pest or pathogen outbreaks. Shifts in the makeup and growth of Indiana’s forests will have consequences for our wildlife and economy. Under the changing conditions expected this century, proactive management decisions are necessary to improve the sustainability and resilience of the state’s forests. Brzostek, E.R., Dragoni, D., Schmid, H.P., Rahman, A.F., Sims, D., Wayson, C.A., Johnson, D.J. and Phillips, R.P. (2014). Chronic water stress reduces tree growth and the carbon sink of deciduous hardwood forests. Global Change Biology, 20(8), pp.2531-2539. Dukes, J.S., Pontius, J., Orwig, D., Garnas, J.R., Rodgers, V.L., Brazee, N., Cooke, B., Theoharids, K.A., Stange, E.E., Harrington, R., Ehrenfeld, J., Gurevitch, J., Lerdau, M., Stinson, K., Wick, R., Ayres, M. (2009). Responses of insect pests, pathogens, and invasive plant species to climate change in the forests of northeastern North America: What can we predict?. Can. J. For. Res. 39: 231-248. Fei, S., Desprez, J.M., Potter, K.M., Jo, I., Knott, J.A., and C.M. Oswalt. (2017). Divergence of species response to climate change. Science Advances 3 (5) e1603055. Johnson, D.J., Flory, S.L., Shelton, A., Huebner, C. and Clay, K. (2015). Interactive effects of a non‐native invasive grass Microstegium vimineum and herbivore exclusion on experimental tree regeneration under differing forest management. J. Appl. Ecol. 52: 210-219. Mech, A.M., Tobin, P.C., Teskey, R.O., Rhea, J.R. and Gandhi, K.J. (2018). Increases in summer temperatures decrease the survival of an invasive forest insect. Biol. Inv. 20: 365-374. Mohan, J.E., Ziska, L.H., Schlesinger, W.H., Thomas, R.B., Sicher, R.C., George, K. and Clark, J.S. (2006). Biomass and toxicity responses of poison ivy (Toxicodendron radicans) to elevated atmospheric CO2. Proc. Nat. Acad. Sci. 103: 9086-9089. Owings, C.F., Jacobs, D.F., Shields, J.M., Saunders, M.R. and Jenkins, M.A. (2017). Individual and interactive effects of white-tailed deer and an exotic shrub on artificial and natural regeneration in mixed hardwood forests. AoB Plants 9: plx024. Talhelm, A.F., Pregitzer, K.S., Kubiske, M.E., Zak, D.R., Campany, C.E., Burton, A.J., Dickson, R.E., Hendrey, G.R., Isebrands, J.G., Lewin, K.F., Nagy, J., and Karnosky, D.F. (2014). Elevated carbon dioxide and ozone alter productivity and ecosystem carbon content in northern temperate forests. Glob. Change Biol. 20: 2492-2504. Terrer, C., Vicca, S., Hungate, B.A., Phillips, R.P. and Prentice, I.C. (2016). Mycorrhizal association as a primary control of the CO2 fertilization effect. Science 353: 72-74. 1 Projected change in soil frost are based on data provided by the IN CCIA Water Resources Working Group (Cherkauer et al., in preparation). The half to two-thirds decline cited in the key messages refers to statewide average projections for the period 2071 to 2100, relative to the period 1984 to 2013, based on medium- (48% decline) and high-emissions (69% decline) scenarios, and soils at 4-inch depth. Additional data appear later in this report. 2 Projected change in temperature averaged across 10 climate models for two scenarios of heat-trapping gas emissions. The “medium”-emissions scenario (RCP 4.5) is the lower bound of the temperature range and the “high”-emissions scenario (RCP 8.5) is the upper bound of the temperature range. The high-emissions scenario represents our current trajectory. Mid-century refers to the 30-year period from 2041 to 2070. Late century refers to the 30-year period from 2071 to 2100. Future temperature changes are relative to the statewide annual average temperature from 1971 to 2000. Further details provided in Widhalm et al. (2018). 3 Southern Indiana refers to the average across the southern third of the state. The range represents outcomes from a medium- and high-emissions scenario (see footnote 2). End of century, also called late century, is the average for the period 2071 to 2100. 4 Historical period is the average from 1915 to 2013. See Widhalm et al. (2018) for details. 5 Projected change in precipitation averaged across 10 climate models for two scenarios of heat-trapping gas emissions (medium and high). Percent change is relative to the statewide average from 1971 to 2000. Late century refers to the 30-year period from 2071 to 2100. See Widhalm et al. (2018) for details. 6 Historical data represent the 30-year average from 1984 to 2013. Mid-century refers to the average for the period 2041 to 2070. Data were provided by the IN CCIA Water Resources Working Group (Cherkauer et al., in preparation). 7 Projected changes in tree habitat suitability are for the year 2100 assuming a high-emissions scenario. Data are from the U.S. Forest Service Climate Change Tree Atlas (Prasad et al. 2014). Full species list and projections for medium-emissions scenario are available. 8 White oak is expected to decline in northern Indiana while showing no change in central or southern Indiana. 9 Projected change based on high-emissions scenario for late century. See Brandt et al. (2014) for details. 10 Additional information available at https://www.in.gov/dnr/kids/5852.htm. 11 Mid-century refers to the average over the period 2041 to 2070. We thank Brian Wallheimer for drafting this report, Stan Coffman for assistance with graphics, and staff from Purdue University’s Department of Agricultural Communication including Maureen Manier, Darrin Pack, Erin Robinson, Kenny Wilson, Andrew Banta, Joan Crow and Russell Merzdorf for help with the production and release of the report. We thank Lenny Farlee, extension forester for the Hardwood Tree Improvement and Regeneration Center at Purdue University, for valuable input. We also thank Steve Shifley at the U.S. Forest Service for his review of the technical manuscript that provided the basis for this report. Thank you to PCCRC managing director Rose Filley for valuable input. We are grateful to Nina Collins and Marcia Wilhelm-South from the Purdue University Libraries Scholarly Publishing Division for online publication support for all documents associated with the IN CCIA.